I think it is pretty easy to say the best and most important brewery in Maine is Allagash Brewing. Rob Tod, the founder of Allagash decided to focus on Belgian style ales, and his timing was perfect. He was perfecting his recipe for his White just as the Belgian beer crazy started to really heat up in the US. White is a style of beer called a wit, which is a pale beer, usually cloudy, made with pilsner malt and about 30% unmalted wheat. Traditionally brewed with spices such as orange peel and coriander, historically it was a little sharp and acidic. The style was pretty much dead in its native land until Pierre Celis opened a brewery in Hoegaarden and resurrected this style. Hoegaarden became a success, and with it launched the rebirth of wit beers. This beer is meant to be drunk young, with a spicy slightly tart note, they are very popular summer beers. Last year, Allagash hosted a American Homebrewer’s club meeting which I got to attend. What can I say, it was a blast. We got to tour their brewery, checked out their barrel room, and they opened some of their experimental sour’s. Allagash has about 5 regularly produced beers, and quite a few very limited release or tribute beers they make on smaller scale. However, when I asked one of the brewers he said 80% of their production is White. All the cool things they do, all the experiments with spontaneous fermentation, barrel aging, blending, fermenting with house strains of brett, is paid for by White. Since the weather is warming up here, and I spent 2 days outside doing my spring yard clean up and getting my gardens set and ready for the year, I figured what better way to celebrate the return of the sun and warm weather then to revisit White. Taste: Beer pours with a 2 finger head that quickly falls, leaving some lacing in the glass. It has a cloudy, straw yellow color. The nose has a spicy note, peppery. It is not banana like German weiss beers. Has some citrusy lemon to it, and a certain musty smell, which maybe yeast or hops, not really sure. On the tongue it is prickly at first, with coriander and some peppery spiciness. You get some malt sweetness, then it ends with a slight tart/bitterness, as well as a bit of a mustiness, which I think is coming from the yeast. It is very smooth, and very easy to drink. Quite refreshing. Ok, first off, I want to thank Joel from the homebrewers club for convincing me to try this beer again. I admit, wheat beers are not my usual cup of tea. 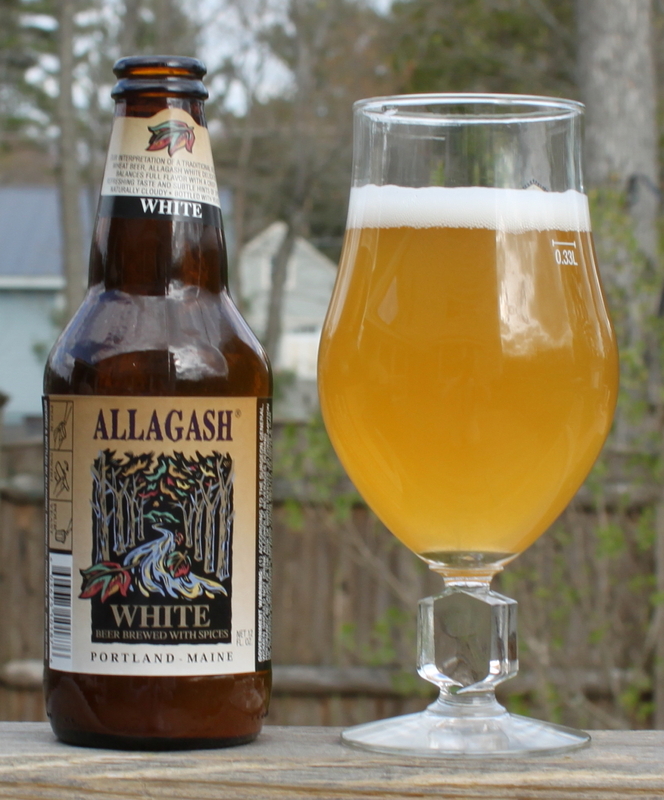 However, I am learning to appreciate them more, and Allagash White is pretty much one of the benchmark for this style now. It has a spiciness that I enjoyed quite a bit, and it is a very easy beer to drink, something that would go well sitting on the deck, enjoying a warm summer afternoon. I can see myself enjoying this from time to time over the summer.